Can you even begin to believe it’s Friday? It doesn’t feel like Friday. I don’t know what day it feels like, but certainly not Friday. Maybe Wednesday, since the world went back to work two days ago? Actually, I know a lot of people who went back yesterday, so it might feel like a Tuesday. But a lot of you still have kiddies at home, so it might not feel like a Tuesday or Wednesday at all to you. Maybe it feels like a Thursday since trash day was pushed back a day this week? Whatever the case, it does not feel like a Friday. 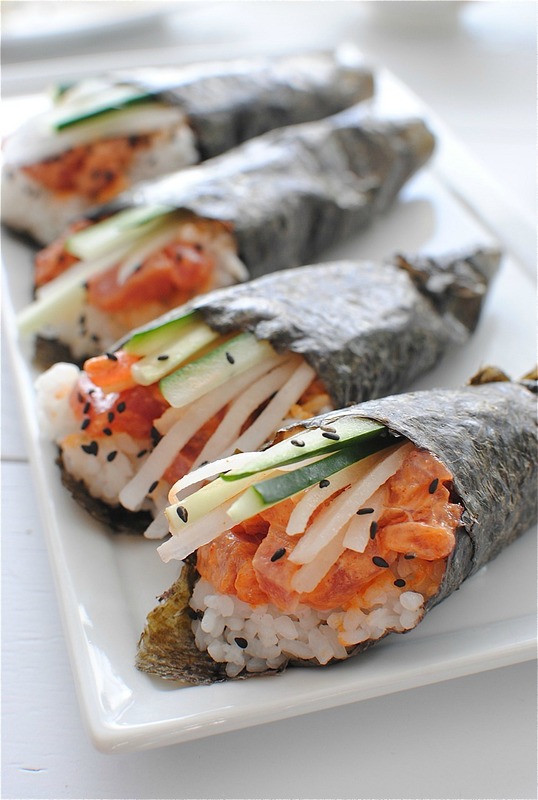 My crystal clear message in all of this is, it’s time to throw down because I made spicy tuna hand rolls! Otherwise known in my head as, spawcy tewna hayand rawls. But I don’t really talk like that in real life. I feel like I should clarify that right now. I don’t really have that kind of accent. Unless I’m joking around. Which unfortunately for everyone in my life is 99.999999999% of the time. Remember my young, hip 23 year old brother-in-law I was telling you about? Well, for Christmas he gave me this rad to the bone “Simply Sushi” kit with all these cool sushi-making utensils and what not, and I squealed at 45,927 decibels and broke all the windows in the house. It even came with a DVD, which was insanely helpful because I’m a total visual gal. Give me verbal instructions to bone a duck and I’ll bone a picnic table. And that totally came out wrong. 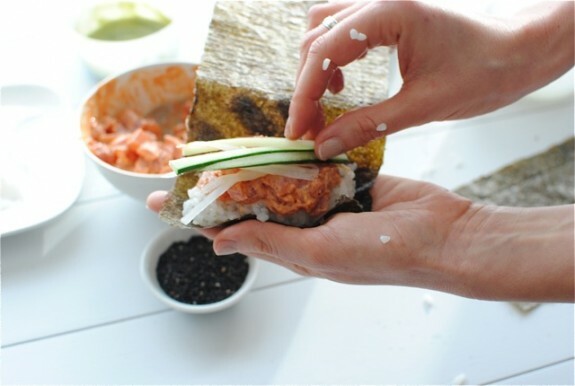 Aaron and I made spicy tuna hand rolls once about 87 years ago, and they were wonk.a.lonk. I won’t lie, dudes. It’s pretty intimidating the first time. Since you’re eating raw fish you have to maaaaake suuuuuure you buy the freeeeeeshest sushi graaaaade tuna or else you’ll grow a 7-foot checkered scaly tail by morn’. Okay there’s the sushi rice, which to prepare will require some TLC, but I hear that if you have a glass of sauv blanc on hand, it helps. Then you place it in the nori paper (the rice, not the wine), and make a little well with your middle finger, like a weirdo. Why I didn’t use my index finger I have no idea. Okay smear a little wasabi down in it. There ya go. 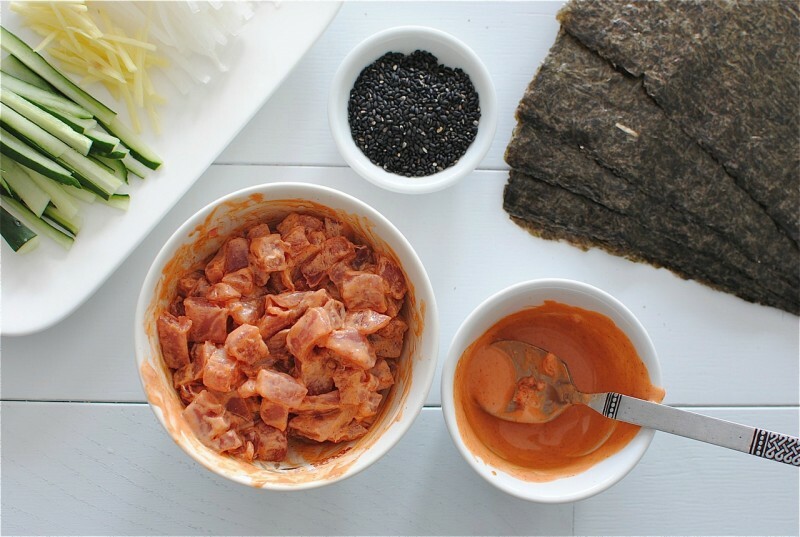 Now scoop some spicy tuna down in der. 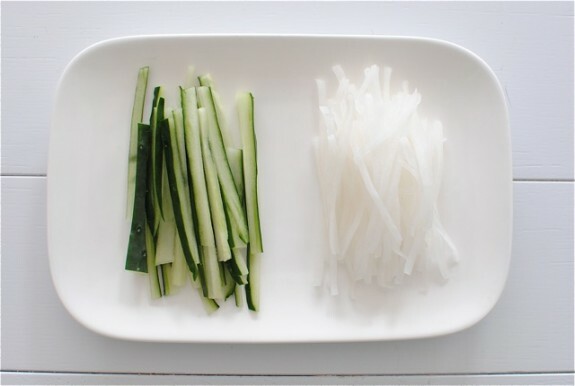 Then lightly place some thinly sliced cucumber, maybe some fresh ginger slices, and some daikon radishes on top. Whatever you want really. Just not a steak. That would be weird. Then you’ll fold her over like this, and wrap it up into a little roll! By the way, I’m trying to decide if I should become a watch person this year. What do you think? I used to wear a watch in junior high, but it fell off all the time. My wrists are weird. I’m also trying to decide if I should become a banana clip person, but I won’t put that burden on you. Seriously. Once these were complete I giggled at 86,235 decibels and broke all the windows in our house. 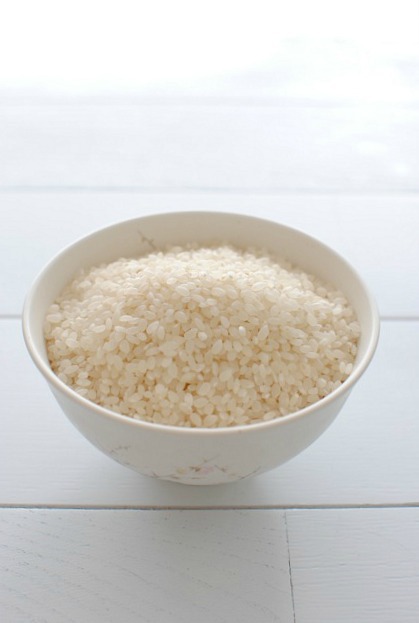 Place rice in a large bowl. 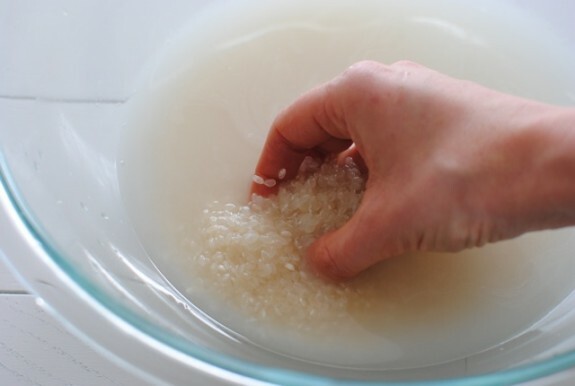 Add about 2 cups of water and gently massage the rice for about a minute, releasing a TON of starch. Drain the water and then add more. Massage, drain, add, massage, drain, add, you know. Do this about 5 times until the water is nearly clear. Add the rice to a rice cooker. Cover with 1 cup of water. Turn her on and fugget it. In the meantime, add the rice vinegar, sugar and salt to a small saucepan. Heat it over medium until the granules have dissolved, a couple of minutes. Set aside. When the rice is done, transfer it to a large shallow bowl or dish. Hold a flat, wide wooden spoon over the rice and pour the vinegar mixture over the spoon, letting it gently fall over the rice. 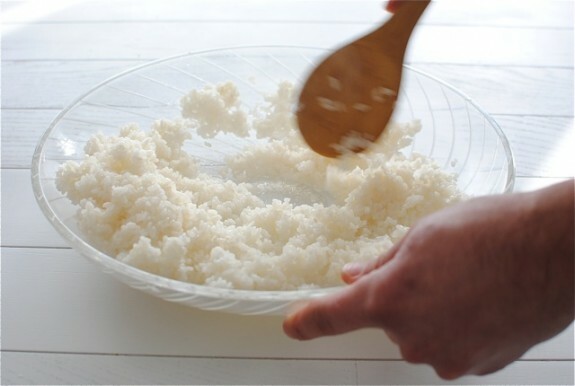 Then lightly toss the rice around the bowl, letting the vinegar mixture coat the rice. Then with the spoon, scoot the rice to one side of the bowl. Little by little, sort of “cut” the rice with the spoon and fan it across the bowl. Keep going until each grain of rice is nice and separated in the bowl. Does this make sense? If not, watch this video. Cover with a damp cloth and set aside. Okay, the rice is good and ready. Now, in a small bowl, whisk the mayo and sriracha sauce together until combined. Toss it with the diced tuna. Prepare the tezu mixture, which is seriously just combining the vinegar and water. Done. This is going to keep your hands from sticking to the rice. 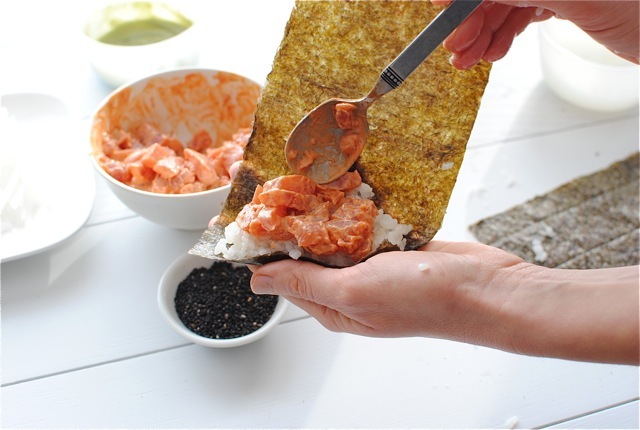 Place a nori sheet in your left hand, shiny side down. Dip your right hand in the tezu mixture. 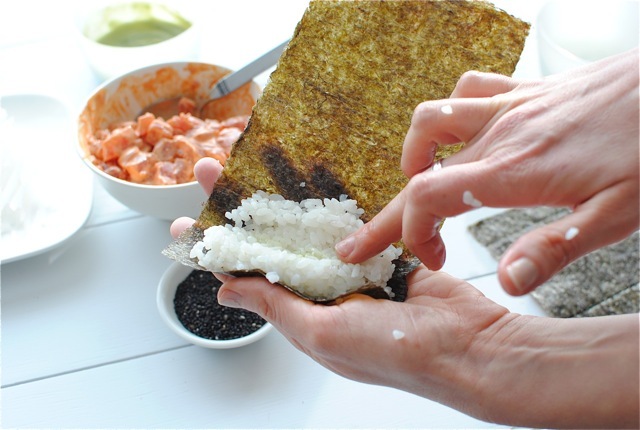 Grab a fist-size mound of sushi rice and compact it in your hand. See how sticky it is?! I know. But that tezu sure helps. Okay place it on the left side of the nori sheet. 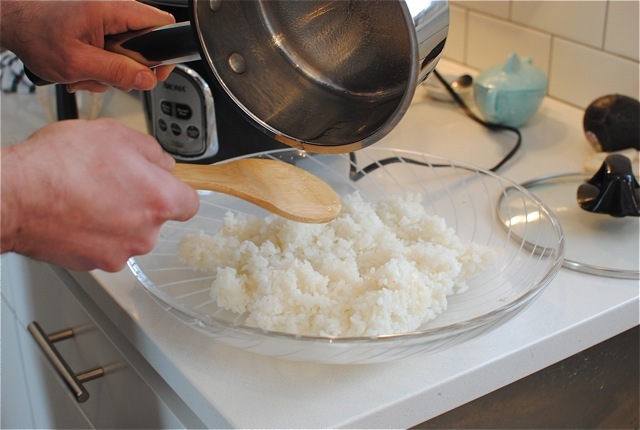 Take a finger and make a slight indention in the center of the rice. Then dip your finger in the wasabi sauce and wipe it down the little well you made in the rice. Then you’re gonna spoon some of that awesome spicy tuna into the well. 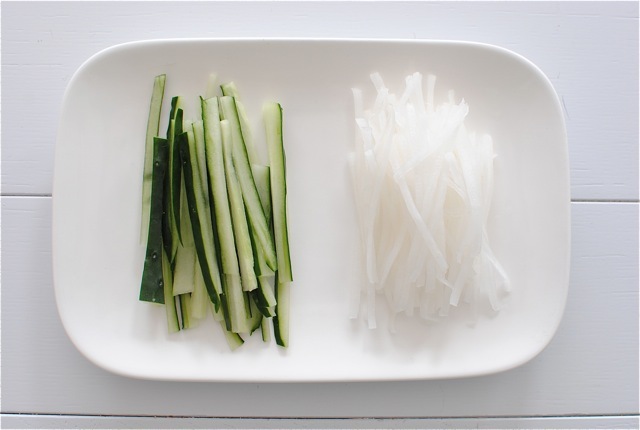 Then top it with sliced cucumber, ginger and daikon radishes. 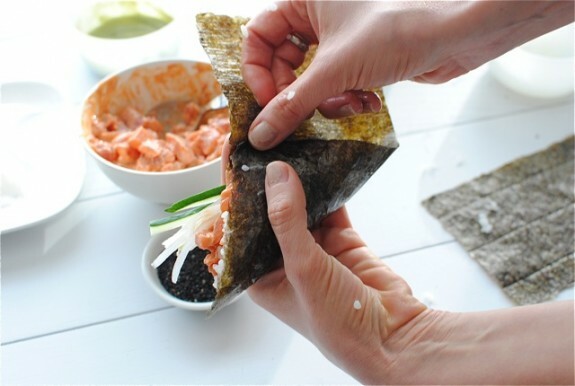 Now, take the bottom left-hand corner of the nori and fold it over the filling until it’s lined up evenly with the top edge of the nori paper. 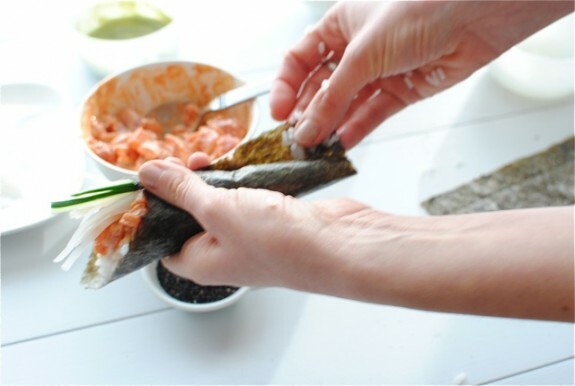 Then just wrap wrap wrap until you have a hand roll! Garnish those muthas with black sesame seeds and just stare at them for like, ever. Look whachew DEED. Dip them in a little soy sauce/wasabi mixture, and hellloooooo, euphoria. Ignore how the ends look. I’m no pro, yo. Oh that rhymed. Okay I’m definitely going for the banana clip. Love love love it!! Sushi holds a special place in my heart, especially spicy tuna (sans funny accent). And I hope you get those windows replaced soon. And I say no watch, but definitely a banana clip. Yes to a watch, no to the banana clip. Must I make all of your life decisions for you? Whoa. Totally impressed. This is all professional-like. I love that you watched a DVD on how to make sushi. Looks amazing! I want these in my mouth. Like, right now. I, too, am a firm believer that a glass of sauv blanc makes everything easier/taste better. Also, these look like so much YUM! I woke up this morning and could not - for the life of me - figure out what day it was. I had to wake up my husband to ask him. Also...SUPER DUPER impressed with your tuna rolls. If it wasn't Friday, I might have the ambition and drive to try it for myself. Maybe next Tuesday. I also tried making sushi once about 87 years ago. It was not very pretty, but tasted great!! Yours are beautiful!! I would love to be a watch person, but my wrist is like "between sizes" if that's even possible. My husband just got me a Garmin for Christmas and it's just like a belt...one link is too tight and the other is too loose. And you can't do the stretchy watch because that pinches! My Facebook status on Wednesday was all about me being confused as to what day of the week it was. Garbage is all screwed up. Mail is all screwed up. Paul is home, no wait...he's not. Oh, yes he is! Also? These rolls? Oh my freaking yes. I am drooling all over myself. I'm drooling all over you! 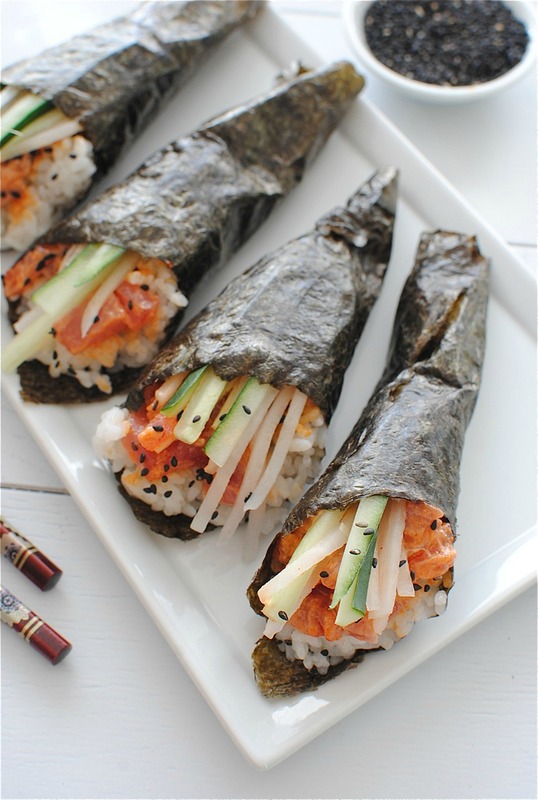 Oh and the hand rolls look good too! 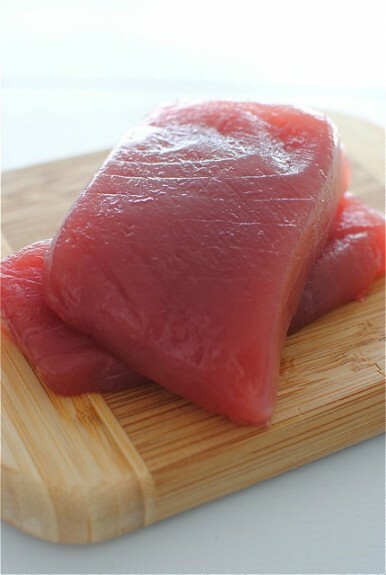 I love spicy tuna rolls but I never know where to buy sushi grade tuna. Where do you suggest finding it? These look yummy! 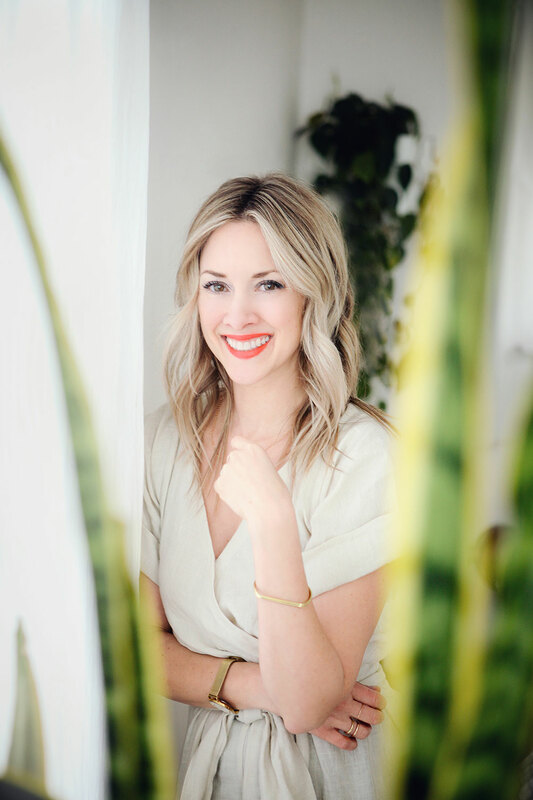 Hi, Kristin! I got mine at Whole Foods. And call them ahead of time to make sure they have some in stock, aaaand when it was delivered. It should say either "sashimi grade" or "sushi grade." Good luck! I hope you can find some! These look absolute BOMB. PS. Raw fish scares me. Totally agree about the raw fish ... scary ...but so tempting! Those look perfect! Do I hear a new profession calling? Not sure if you could wear a watch though if you become a sushi chef, so maybe that's out. They're like a sushi restaurant so PROFESSIONAL! I bow down! We just started making our own sushi too! Surprisingly easy and SO much cheaper! These look fabulous! uhh you totally know the way to my heart. i'm obsessed with sushi and look at those HUNKS of tuna!! so fresh!!! this is amazing, bev. i need to attempt sushi - you might've just given me the push! beautiful!! 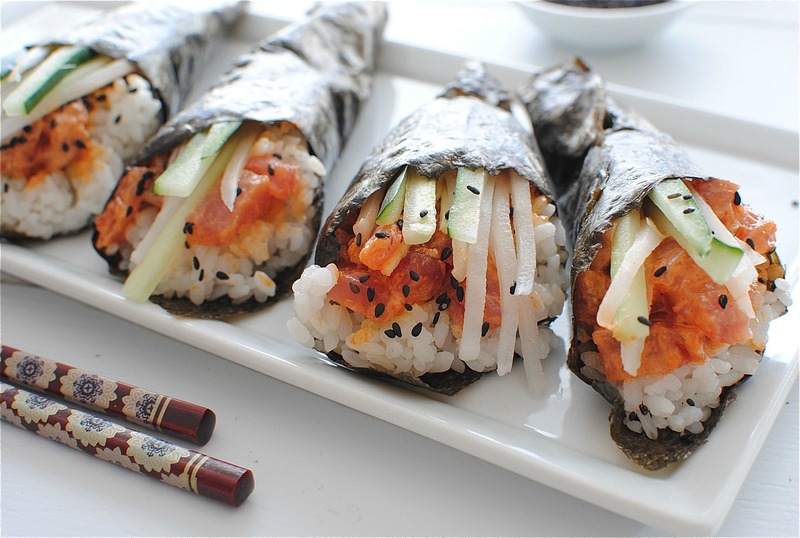 I need to learn how to make sushi, thank you! These look lovely! Totally less intimidating than actual sushi with those weird bamboo rolling things...also, mayo + sriracha = party in my mouth. These are so pretty! I am all for the banana clip, I'm sooo hoping for big hair to come back! You know what's better than this fabulous recipe? Nothing? Except for your hysterical Commentary ... I plan to try these soon ! So glad I found your page ! sushi seriously intimidates me. eating it and making it. :) But you make it look do-able! 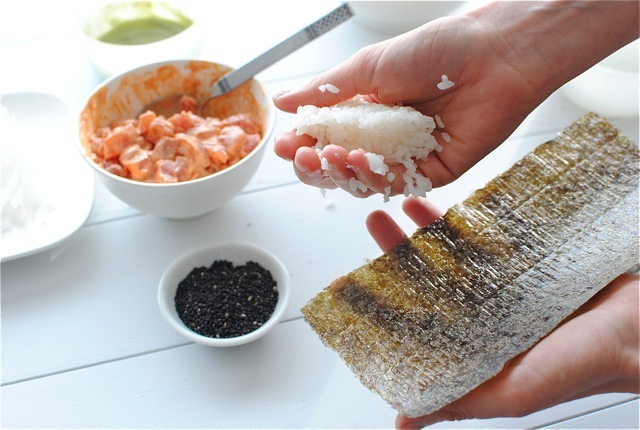 So simple and delicious, I have to try this soon. AAAAhahaha! Bone a picnic table. That's just terrific. But I've got a couple'a hands and Bubba's got plenty of rolls ... together we should be able to tackle these, right? Gorgeous! Just the thing to help get me through gloomy ol' January. I am making these for appetizers for my hubbys bday on Wednesday- These are phenomenal Bev. These look so delicious, Bev! And I love the way you describe them. Makes me want to go make some - RIGHT NOW! I am dying for one of these right now! !